Dokdo-or-Takeshima? : This is a clever video. Unfortunately, everybody on the earth except Korean think it is Korean who act crazy when it comes to Dokdo/Takeshima Issue. I didn't know he updated the contents!! It's excellent and synical, isn't it? The video makes a very good point in a very clever way. And I love the music. Korean's appeasl for Dokdo in this video are the counterevidence Japanese aggression on Dokdo is escalating to the point the Koreans can't stay quiet. Who can trust Japanese claim on Dokdo considering Japanese past of territorial aggression on other countries? The biggest Japanese false claim is that Japan established the sovereignty on Dokdo in the late 17th century and incorporated Dokdo into Japanese land because it was ownerless in 1905. Who can believe this self-contradictory claim? Japanese incorporation on Dokdo in 1905 is far from the righteous procedure according to international law. As for the Japanese old map appeared in the video with a wording "Takeshima is Japan's territory. ", it's an imitated map published in 1846, not an original one. 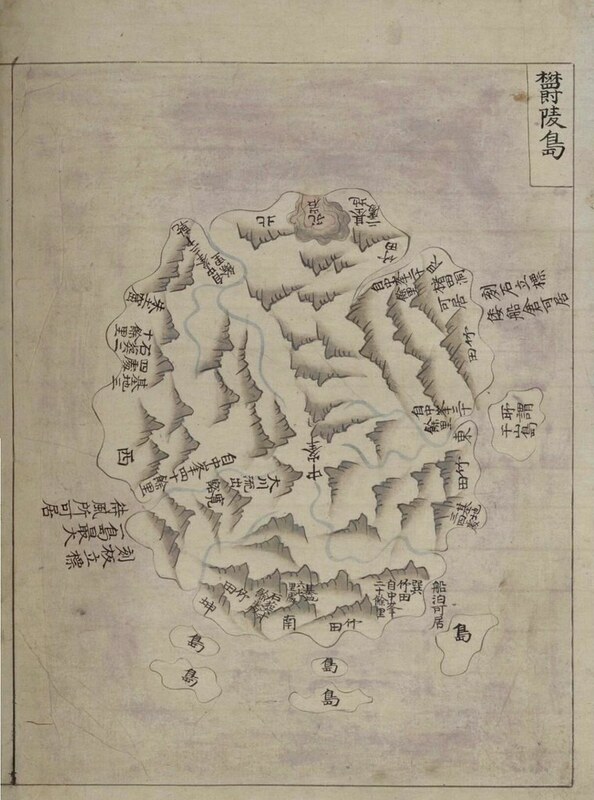 "In the original "改正日本輿地路程全図" published in 1779, Dokdo is depicted outside of Japanese territory. 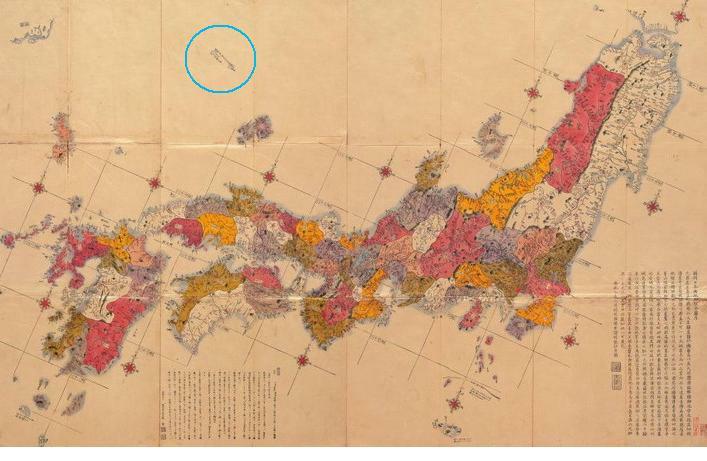 Japanese government presents "改正日本輿地路程全図" of 1884 made after the death of the cartographer of "改正日本輿地路程全図(1779)" as the evidence Japan long recognized the existence of Dokdo, but its original map is also the evidence Japan didn't considered Dokdo as the Japanese land. The stance of Korea on ICJ is that Korea has neither any reason to go to the ICJ . Why should Korea ask the 3rd parties to judge whether Korean land is Korean land or not? Going to ICJ itself is saying "Dokdo is not Korean land." I'm sure the Japanese government knows Korea would never go to ICJ. Japan's stubborn asking Korea to do what Korea will not do is simply morally wrong. I know how you are upset, but I suggest you stay cool whenever you meet this kind of distorted videos. There are lots of Japanese made You-tube videos with full of lies. This video is just one of them. You are brainwashed by your own government. It is no use of jumping on Japanese careless maps without colouring, since there are Japanes maps which coloured both islands as Japanse territory. In fact, it is obvious that Nagakubo did considered both islands as Japanese territory. What Korea required to do is to present the old KOREAN maps with today's Takeshima, not presenting Japanese maps without/uncoloured Takeshima. Japan had officially incorporated it into territory in 1905, so the Japanese maps before that is hardly be a crucial evidencece on Korean side in the first place. There're various non painted Matsusima version maps. Of course it's Japan's territory. Fukuyama han(a part of present-day Hiroshima prefecture), takeshima and Matsusima were not painted. 白色隠岐島後 Takeshima, Matsushima and Oki' Touzen painted, but uncolored Oki' Tougo version. I'm sick of Japanese shouting "You are brainwashed by your own government." Do es the Japanese government can brainwash her people? I just said the fact. 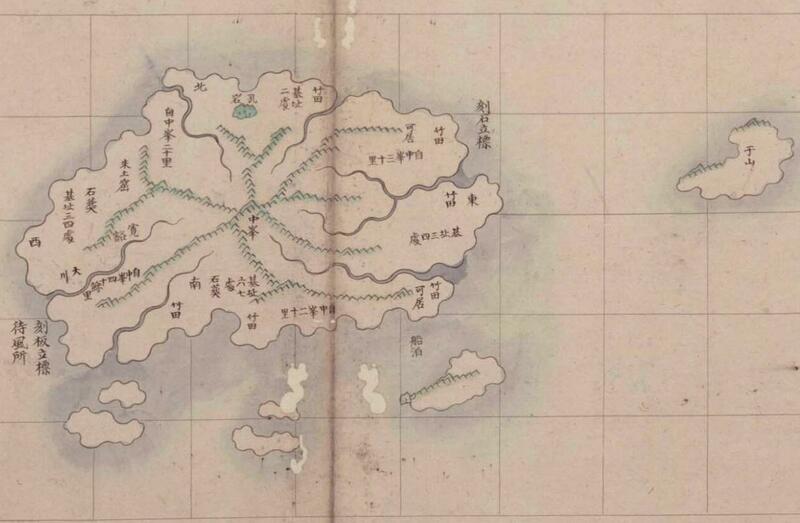 The map 「亜細亜小東洋図」was published in 1835 and colored Ulleongdo and Dokdo as Japanese land. This map is just inaccurate. Historically, Ulleongdo has never been a Japanese land. In 1669, the Japanese government officially prohibited the Japanese to travel to Ulleongdo because it was Korean land. And in 1837, the Japanese government reconfirmed Ulleongdo was not Japanese land. Maybe, 「亜細亜小東洋図」 reflects the mapmaker's longing for Ulleongdo and Dokdo as Japanese land, but this map has a serious flaw against the historical fact. There is an evidence Nagakubo Sekisui(長久保赤水) didn't consider both islands as Japanese territory. In his map "改正日本輿地路程全図" of 1779, he wrote the phrase "見高麗猶雲州望隠州((Viewing Koryo (Korea) is the same as viewing Onshu (Oki island) from Unshu)" from the book "隠州視聴合記" next to Ulleongdo and Dokdo. "隠州視聴合記" is the first Japanese book excluded Ulleongdo and Dokdo as Japanese land. He clearly showed he didn't consider Ulleongdo and Dokdo as Japanese land by adding this phrase. By the way, I have a question. 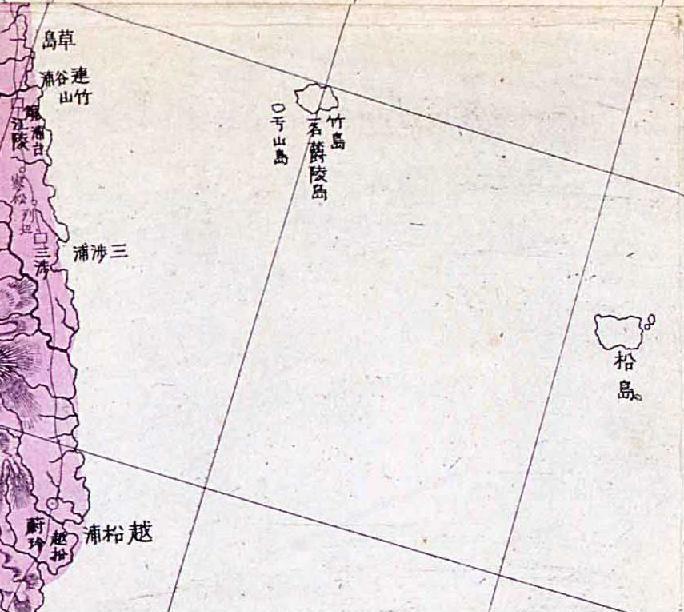 長久保赤水 died in 1801, but this map was published in 1835. Why is that so? why don't Korea make this kind of video? I have already heard almost all of your claim many times, on and on, so that's the reason I think you are brainwashed and I'm sick of it, too. If you want to claim you are not, then why don't you go museum, library or archive to bring the first hand historical evidence, not others' logic/url. There were clever Korean who eager to finding historical resourses before. I really respect and miss him. In 1696, voyage to Ulleungdo alone, not Takeshima, was banned, but it was only conveyed to Tottori and Tsushima. Nagakubo reside in Mito, then Edo, so it is natural that he didn't know about the ban and considered both islands are Japanese territory from the description of "隠州視聴合記" . This version of 「亜細亜小東洋図」 was published before 1837, the year when Bakufu prohibited voyage to Ulleungdo, but didn't mention anything about Matsushima, today's Takeshima. In international law, this fact is very important. Many Japanese in Edo considered "隠州視聴合記" didn't exclude both islands from Japanese territory. 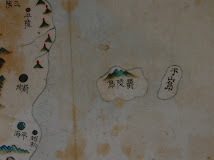 「亜細亜小東洋図」 and other maps painted Takeshima and Matsushima as Japanese territory explains it. Q. "By the way, I have a question. 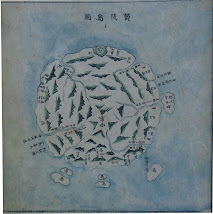 長久保赤水 died in 1801, but this map was published in 1835. Why is that so? " A. Google it. Very easy. ・Japanese Government General of Korea confiscated 40% of farmland of the whole country from a farmer in the times when Japan governed Korea. ・Japanese Government General of Korea took half of rice produced in Korea and sent it to Japan. ・The Japanese Government took 6,500,000 Koreans and drove them hard like a slave without paying the wage. But all these were lies. This is an excellent brainwashing act. Will the brainwashing act of Korea be really only these? When modernized country talked their history as “social science”, they give importance to fact based social statistics. Even though they are sometimes estimated one, we could argue the accuracy or method of estimations, and these arguments would be progressing as objective science. So, social statistics would cultivate some comparable sense of history, not as ideology but as social science. Of course, some countries have not had enough historical statistics, like population, taxing, average life span, income, or anything, which helped to imagine how their countries were. Basically from ancient history to now, good regimes have remained many statistics and evidences, because they were vitally important for adequate governing. And naturally they could be tolerable by eyes of future citizens and historians. By the way, I know some Korean scholars who are talking how Korean had been governed by Japan in early 20th century from the viewpoint of social statistics. They are basically economists, or economic historians. Korean population at 1753, it was estimated 73 million. It was estimated 75 million at 1850. It was 98 million at 1906. It was 131 million at 1910. It was 240 million at 1942. They are of course one side of history; but when we argue Japan’s government in Korea, it seems to be desirable that the argument is based also on social statistics, to deepen mutual understanding. How do you know if I'm going to the library or museum? Of course, I can't either go to the museum in Japan or reading Japanee documents. I'm well aware of what your logic is in this blog and they are noting but the ordinary pro-Japanese claims. Nothing new. And I also know how you react when you are bothered by Korean claims. If you didn't like my claims, why didn't you refute me then? You don't need to attack me in a such a mean way in proving you are right. 1. He did consider Ulleongdo and Dokdo as Koeran land by uncloloring differently from Oki Island and same as Korea. It's so simple fact can't be denied. 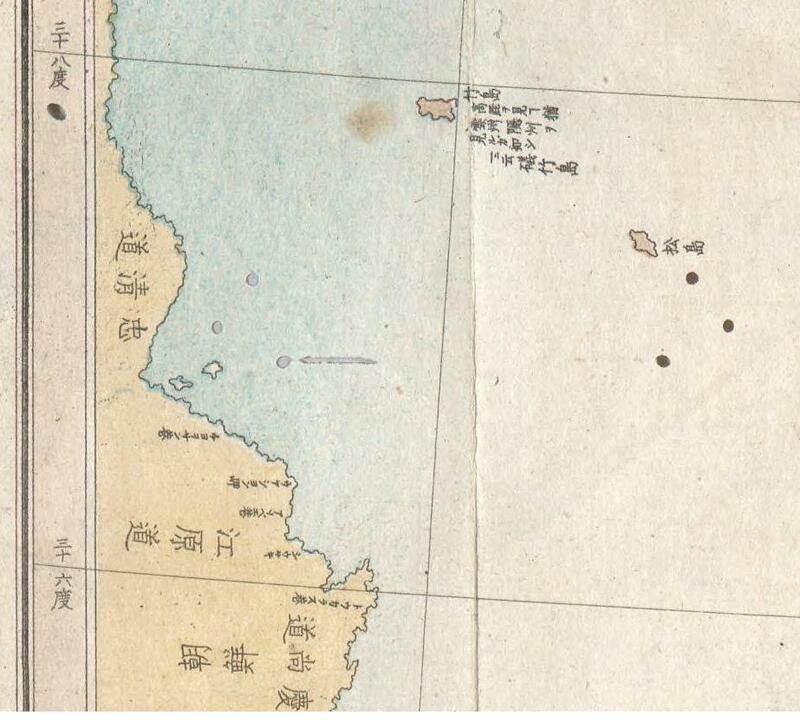 In the map of 1846, Ulloengdo and Dokdo colored same as Oki Island. Japanese "Web Takeshima Research Center" wrote about it that "松島竹島は隠岐と同じ黄色に彩色されている。（朝鮮半島は茶色)". It can be translated "Takehsima(Ulleongdo) and Matsushima(Dokdo) are colored same as Oki Island. (Mainland Korea is uncolored.)" Coloring in the maps is important. 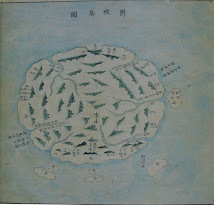 If Nagakubo considered those two islands as Japanese land, he must have colored them same as Oki Island in his map of 1779. 2. 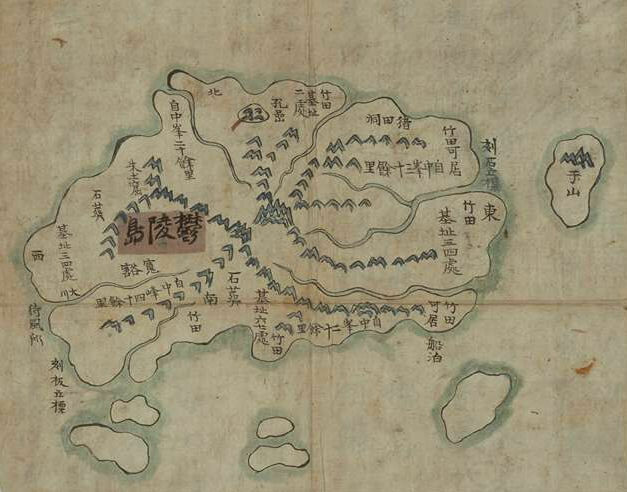 Nakagubo drew Ulleongdo and Dokdo outside the grid of Japan’s longitudinal and latitudinal lines in his map of 1779, which mean he didn't think those two islands were within Japanese territory. 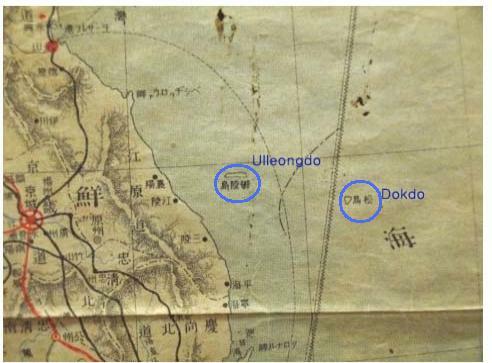 On the other hand, there are longitude and latitude lines around Ulleongdo and Dokdo in the map of 1846 showing they are within Japanese territory. 3. Nakagubo reconfirmed his perception on Ulleongdo and Dokdo as Korean lang by adding the phrase from "隠州視聴合記". "隠州視聴合記" wrote "Viewing Koryo (Korea) is the same as viewing Onshu (Oki island) from Unshu) from Unshu (Izumo)". You just said Nagakubo didn't know Edo Bakuhu's voyage ban to Ulleongdo because he was from Mito, not from Tottori and many Japanese in Edo considered "隠州視聴合記" didn't exclude both islands from Japanese territory. Your assumption is not persuasive. It's highly unlikely the famous Japanese mapmaker didn't know Edo Bakuhu's voyage ban to Ulleongdo and misinterpret the important document. In short, Nagakubo excluded Ulleogndo and Dokdo as Japanese land by not coloring same as Oki Island and by not locating them within the grid of Japan’s longitudinal and latitudinal lines in his map of 1779. I don't know how to find why 「亜細亜小東洋図」 was published 34 years after his death in google. Please tell me if you know. I'm very curious about it. But it's ok if you don't want to tell me. You totally misuderstand. What you need to do is not go to find Japanese document, but KOREAN. And if you don't understand why this "version" of map was published after he died, then it means you don't have basic knowledge of the map. 隠岐島後 Uncolored Oki' Dougo but Takeshima, Matsushima and Oki' Touzen painted. I've already showed these maps three times. I looked at the maps you suggested. AD1741　大日本国全図 : It's just a black and white map and Ulleongdo and Dokdo are outside the grid of Japan’s longitudinal and latitudinal lines around Japan. Ana a small part of Korean was drawn. How do you conclude those islands are Japanese land in this map? AD1778　大日本輿地路程全圖　: Ulleongdo and Dokdo are uncolored same as mainland Korea and outside the grid of Japan’s longitudinal and latitudinal lines . AD1783　大日本国図 : It's just black and white map. AD1808　大日本細見指掌全圖 : The image is not clear enough. 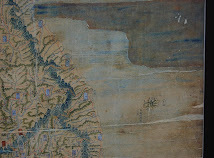 AD1833 改正日本輿地路程全圖　: Do you mean this map at http://www.geocities.jp/tanaka_kunitaka/takeshima/newyochiroteimap-1833/map.jpg? Ulleongdo and Dokdo are uncolored same as mainland Korea and outside the grid of Japan’s longitudinal and latitudinal lines. 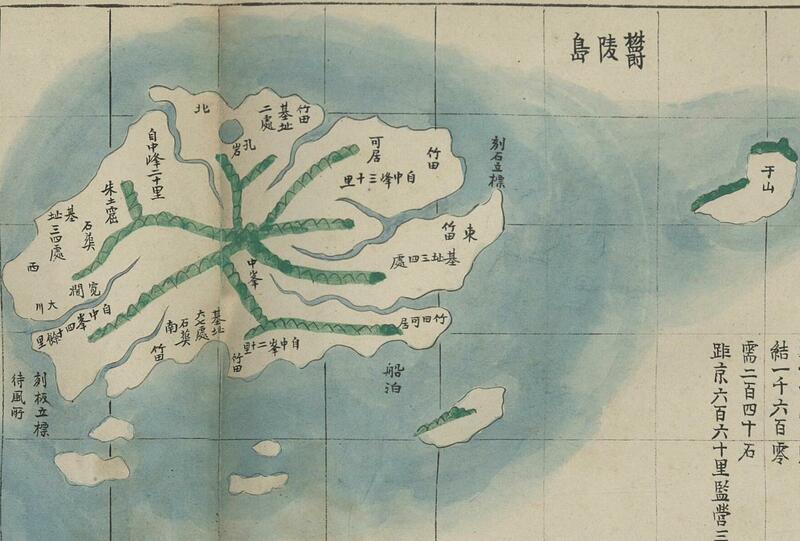 AD 1855 大日本国全圖　: It's a same map as the first on "大日本国全図(1741)"
I know about the Koeran documents as well as you do. Don't concern about me. You said " if you don't understand why this "version" of map was published after he died, then it means you don't have basic knowledge of the map." Why don't you just give the reason to me who don't have the basic knowledge of the map? Isn't this blog the place for finding new knowledge? But please don't mind if you don't want. You asked "Have you even seen the map 「改正日本輿地路程全図」?". Do you think I'm talking about that map without looking at it? Of course, I didn't look at the original one. You wrote "...the un-colouring of the map of the remote islands in the map doesn't mean they are excluded from Japan. Okinoshima and Kuchinoerabu, Ezo in the first version, and Hachijojima Okinoshima, Kuchinoerabu and Ezo in the second version are not coloured, respectively.". I think it's you who don't understand the map. How can you compare Ulleongdo and Dokdo with those islands? 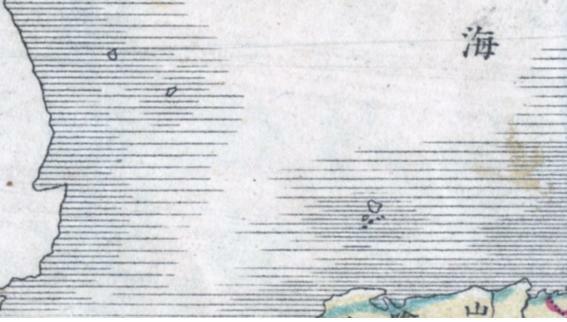 I don't what those islands are, but I'm sure they must be very small and remote islands of Japan which the mapmaker probably didn't care at all. But Ulloengdo and Dokdo are different from those to Japan. How many years the Japanese fishermen illegally did fishing activites in those islands? And if Nakagubo treated Ulleongdo and Dokdo like the mentioned other islands, he didn't write the phrase from ""隠州視聴合記". Thank you so much for telling me you noticed Pusan area in their maps. Every map mentioned voyage route for 和館 in Pusan via Tsushima. 和館 was the Japanese Embassy in Korea at that time. Therefore only Pusan area was described, Korean land nevertheless. Takeshima and Matsushima shown as Japan's territory obviously in these maps. "I'm sure they must be very small and remote islands of Japan which the mapmaker probably didn't care at all. " Please teach me if I'm wrong. Yes, Pusan is Korean land. What is the evidence Takeshima and Matsushima were shown as Japan's territory? KBS 스페셜 "독점발굴, 독도의 증언"
울릉도에 출입하는 모든 화물에 세금을 받으라는 운영세칙이 담겨있다. 그리고 당시 일본인들은 독도에서 잡은 강치를 울릉도에 가져와 수출했다는 사실이 일본 외무성의 기록에 남아있다. 일본인들이 독도에서 잡은 강치에 대한 수출세를 울도군수에게 납부했다는 것이 밝혀진 셈이다. 우리는 이를 통해 대한제국의 행정력이 독도에까지 미쳤음을 똑똑히 확인할 수 있다." p.s. 영상에는 '울도군 절목'의 내용을 뒷받침하는 더 많은 근거 자료가 포함되어 있습니다. You wrote " islands which Koreans circled with a red pen are Argonaut and Dagelet. 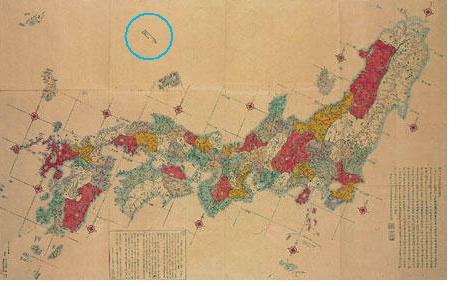 Takeshima(Dokdo) on the map was marked out with the red they drew.I don't know whether they did it on purpose or not." 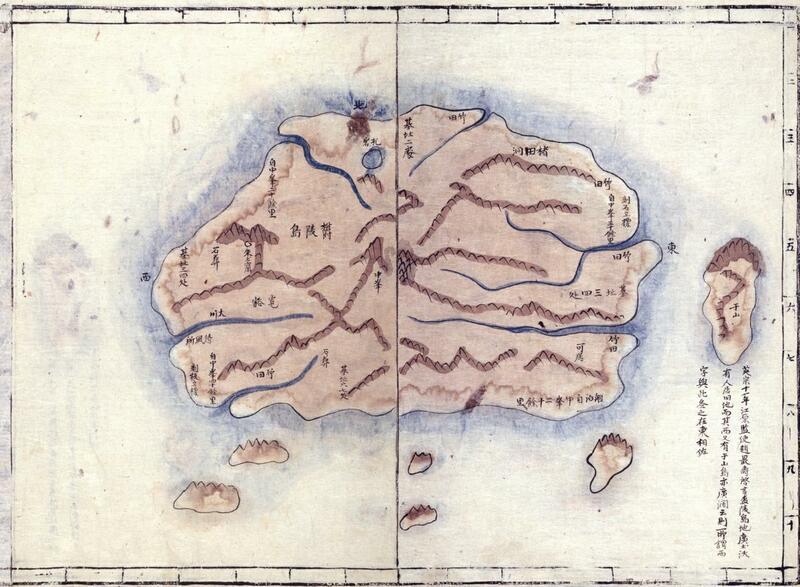 Can you explain why those two islands in the red circle are argonaut and Dagelet? And do you know where Dokdo is? The two islands in the circle are Ulleongdo and Dokdo which are drawn as Korean land. Can you see a tiny dot between Oki islands and two islands circled with red? It's Takeshima(Dokdo). This map was made before 1900, so there was still confusion on the maps in Japan. This is one of typical 19c's maps of Japan. Korean TV did it on purpose. I have some points which don't make sense and I don't know the islet is Korean or Japanese, so I'd like to ask questions. 1. As for the 隠州視聴合紀, I cannot understand this is why 州 can be interpreted as an island. If this were an island, the author should have written as 島. "Oki can be seen from the Izumo (so Oki is Japanese territory)" and "Korea can be seen from the island ( so the island is Korean territory)". I don't know which island is indicated but this interpretation seems natural. I want to ask about the interpretation. 3.Though SF treaty didn't refer to over the islet (Am I wrong? ), Japan lose the sovereignty according to the SCAPIN 677. So, it seemed the islet was no one's. Why can Japanese gov. advocate the sovereignty? I am very glad if someone would answer. 1.The author recognized Takeshima and Matsushima belonged to Onshu. That's why he wrote "this shu 此州" when referring to Takeshima in the preceding sentence(見高麗如雲州望隠州). In this book, every island called without the name of Shu are all Onshu's. It can be read like this, too. But I read "No other island which seems to be Japanese territory or uninhabited can be found between Ulleungdo and Korea, so we determine Ulleungdo is the northwesternmost territory of Japan". 2.Korea never declared her sovereignty over Dokdo. If she did before 1905, Dokdo legally became Korean territory in accordance with the rules of occupation(sovereignty goes to the country who found ownerless island first) of international law. Notification is not legally necessary. Although the exercise of administration or jurisdiction is required to prove effective control, in the case of uninhabited islands like Takeshima, the usage becomes the biggest factor of effective control. 3.SCAPIN677 was just a draft. Its paragraph 6 says "Nothing in this directive shall be construed as an indication of Allied policy relating to the ultimate determination of the minor islands referred to in Article 8 of the Potsdam Declaration." No country signed this draft. I was almost misled by your picture. This is the picture you should watch. There's no island looking like Dokdo. It's just a dot. You can see similar dots around. In this map, the two islands are Ulleongdo and Dokdo and they are included as Korean land. To understand why Ulleongdo is in the postion of Argonaut, please go here. You can get some help why the Japanese drew Ulloengdo and Dokdo in the inaccurate positions in 1880s. Thank you for your answer. I am glad to get an answer. If possible, I want an answer from opposite side as well. The 1667 Onshu Shico Goki (隠州視聴合記) was describing the Country of Oki by giving its boundaries relative to other Japanese territory. By listing Matsushima (Liancourt Rocks) and Takeshima (Ulleungdo) the writer believed those two islands to be part of not only Japanese territory but also part of Oki, as outlying islands. The 州 in the document was referring to Oki, not to Matsushima or Takeshima, which the writer believed to be outlying islands of Oki. The Japanese did not travel beyond Takeshima (Ulleungdo), so the writer did not know the exact distance from Takeshima to Korea, so he described the distance by saying that it was close enough to be seen in the distance from Takeshima. To make it clearer, he compared it to looking at Oki Island from Unshu, the distance of which the Japanese did know. Because Korea was beyond Takeshima and because Takeshima was considered to be part of Oki Country, the writer believed Oki Country to be the northwest boundary of Japan. (From Oki) If you go northwest for two days, you reach Matsushima (Liancourt Rocks), and one day farther is Takeshima(Ulleungdo), which is commonly called Iso-Takeshima, with much bamboo, fish, and sea lions. These two islands are uninhabited. Because looking at Koryo is like looking at Onshu (Oki Island) from Unshu (a place east of Shimane Prefecture), this place (Oki) is considered the northwest boundary of Japan. We know Japan considered the two islands to be part of Japanese territory because Japan had a fight with Korea over ownership of Takeshima in the 1690s. 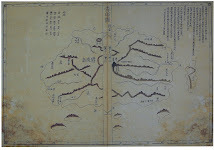 As for the map in Japanese old textbook, another textbook seems to be preserved in korean museum. I cannot say which is true. And I do not think that either side put or erased on purpose. It might be due to printer or preservation. For example, there is a black dot in the sea under the 満州 in korean one. Such a dot would be printed or not printed. And the resolution is also a matter. The dot may be erased by shrinking the size. Though, I do not think Korean side did it on purpose. For me, this picture is sort of weird. This enlarged picture's contrast seems to be emphasized ( and/or differentiated edge detection? ). This degrades the data. Though social study or politics is not my major. Anyway, did not Japanese gov. consider the island as japanese territory? Even if the japanese one is right, the island was located on not Korea oder Japan. Thank you for the answer. It helps me a lot. 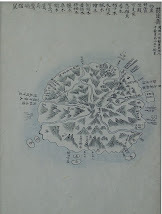 Look at the map below and compare two islands' locations with 新撰地誌's map. There's nothing strange or wrong with it as a map made in late 19c. Sometimes Takeshima(Dokdo) was omitted, sometimes three islands(Argonaut, Dagelet, and Liancourt rocks) were drawn. This map is latter. Besides, how is this map related to sovereignty? I can't see any borderlines of territory. According to his thesis, "州" was used 66 times in the whole text of "隠州視聴合紀" and 65 words of "州" was used as the meaning of province. Besides, when the writer mentions same island again later by combing with the "此", he used the word "此島(this island)" not "此州(this province)" Thus, "此州" in the last sentence is proved to indicate the province "Oki lsland." Ulleongdo(Takeshima) and Dokdo(Matsushima) can't be called as the province because they are uninhabited islands. As you implied, interpreting "此州" as Ulleongdo(Takeshima then) and Dokdo(Matsushima then) is very unnatural. This is my answer to your question 2. In the end of 19th century, the Japanese encroachment and illegal logging in Ulleongdo had become a serious problem. 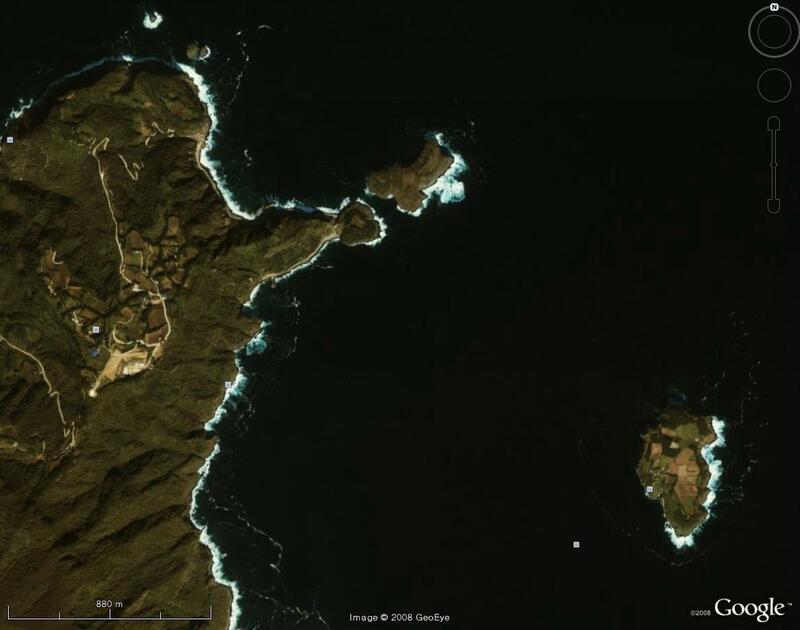 So the Korean government decided to abandon the vacant island policy and develop and resettle the Ulleungdo area. 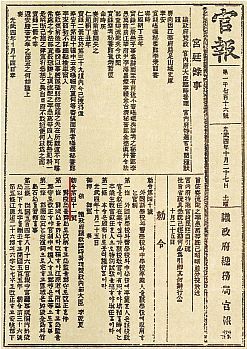 As a result, the Korea promulgated Korean Ordinance No 41. on October 25 1900 which renamed Ulleungdo Uldo and upgraded the office to the County and put Ulleungdo, Jukdo and Seokdo under the jurisdiction of the Uldo County. Jukdo is a small island 2.2km off the Ulleongdo's east coast. Seokdo is the new name of Dokdo. Japanese government didn't notify Korean government of its incorporation of Dokdo in 1905 and didn't make it public enough. Japan's way of “announcing” Japan’s incorporation of Liancourt Rocks as part of Oki County was tiny ad in the local newspaper. How could Korea know about Japanese incorporation of Dokdo?
" The gains would be extremely small while the situation would become grave by acquiring a barren islet suspected of being Korean territory during this war time with Russia. It would amplify the suspicions of various foreign countries that Japan had an ambition to annex Korea." " the incorporation was urgent particularly under the present situation, and it is absolutely necessary and advisable to build watchtowers and install wireless or submarine cable and keep watch on the hostile warships. Particularly in terms of diplomacy, Home Ministry view is not necessary to be considered. The request should be promptly submitted to the related Department." This is how Japan incorporated Dokdo her land. Dokdo was the first victim of Japanese Imperialism on Korea. 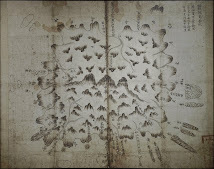 Why do the Japanese try to compare the picture of Ulleongdo and Dokdo taken by satellite today with that of old maps drawn in the 1800s in terms of their location? Anyway, that is the usual way they do when they have to deny the Meiji-era maps depicting Ulleongdo and Dokdo as Korean land. 1. The reason why Ulleongdo and Dokdo were drawn in an inaccurate locations, exactly saying, Ulleongdo and Dokdo are in Argonaut and Ulleongdo positions respectively, is explained in the link I gave. 2. You said "Sometimes Dokdo was omitted." How can you know Dokdo was omitted or not? 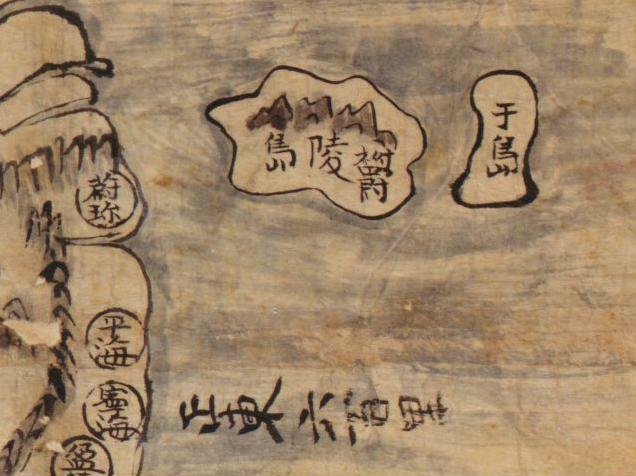 In most Meiji-era Japanese maps, Ulleong and Dokdo are located in the wrong positions. Are you going to say all those maps omitted Dokdo? 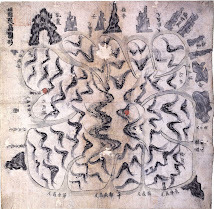 The Japanese had always drawn Ulleongdo and Dokdo together in the maps for such a long time. If Dokdo was omitted, it's very, very unusual. There should be a reason. My opinion is there's no reason the Japanese mapmakers omit Dokdo. 3. You wrote "sometimes three islands(Argonaut, Dagelet, and Liancourt rocks) were drawn. This map is the latter(this case)." The Japanese maps depicting three islands(Argonaut, Dagelet, and Liancourt rocks or Hornet Rocks) are very rare to find. I know only two maps, which are 大日本沿海略図(1867) and 大日本四神全(1870). (If you know more, please let me know.) In other words, the Japanese were not familiar with the western names(Argonaut, Dagelet, Liancourt Rocks). The Japanese government started to call Ulleongdo and Dokdo as "Matsushima" and "Liancourt Rocks" respectively after Amagi's survey to Ulleongdo in 1880, but Japanese traditional names Takeshima and Matsushima were widely and generally used to refer to Ulleongdo and Dokdo respectively. This can be proved by the maps published after 1880. The Japanese mapmakers during the Meiji-era generally drew only two islands -Takeshima(Ulleongdo) and Matsushima(Dokdo)- between mainland Korea and Oki Island which were the islands they had known for a long time. Drawing three islands was not usual for them. I doubt the Japanese mapmakers then knew even the identity of Argonaut and Liancourt Rocks, the western name of Dokdo. Thus, your claim the map of "新撰地誌" drew 3 islands is not plausible at all. This map was for the students. There's no need to teach the students the non-existen Argonaut Island. What matters to them was the two islands-Takeshima(Ulleongdo) and Matsushma(Dokdo)- the Japanese had perceived for a long time, I think. I'd like to add more to my response to your question 1. If "隠州視聴合紀" said Ulleongdo(Takeshima) and Dokdo(Matsushima) were Japanese land, there are questions to ask. 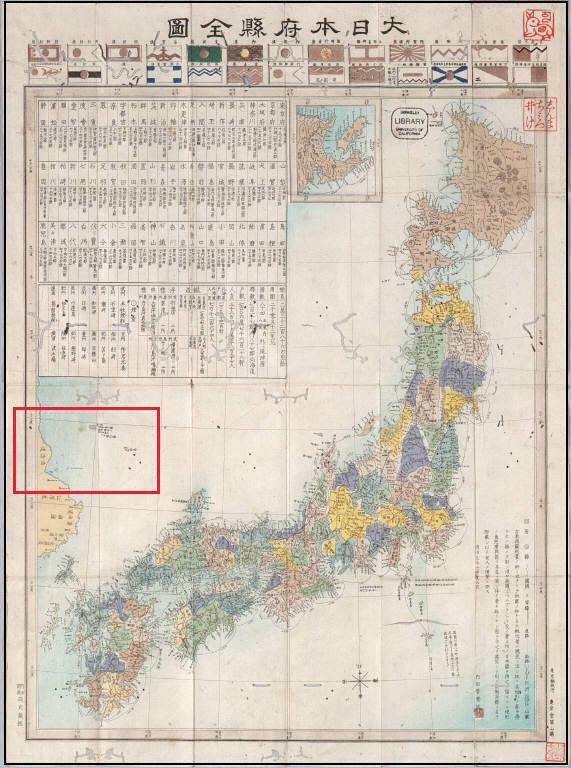 1.Why aren't there Japanese old official maps depicting those two islands as Japanese land? 2. 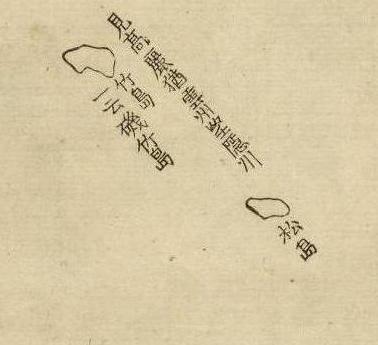 Why did the prominent Japanese scholar Nagakubo Sekisui exclude those two maps as Japanese land and wrote the phrase "見高麗猶雲州望隠州" from "隠州視聴合記" next to those two islands in his map "改正日本輿地路程全図" of 1779? 3. Why did the Edo Bakufu ask the ownership of Takeshima and Matushima in 1695 and 1696? 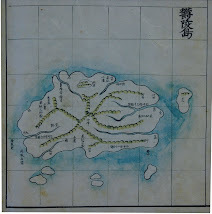 4.Why did the famous Ino's map exclude those two islands as Japanese land? 5. why did the Japanese government incorporate Dokdo into Japanese land saying it was ownerless? The answer to those questions is because Ulleongdo and Dokdo were never considered as Japanese land by Japanese people. Japanese claim "隠州視聴合紀" said Ulleongdo(Takeshima) and Dokdo(Matsushima) were Japanese land just doesn't make any sense. "隠州視聴合紀" clearly wrote the northwest boundary of Japan was Oki lsland. 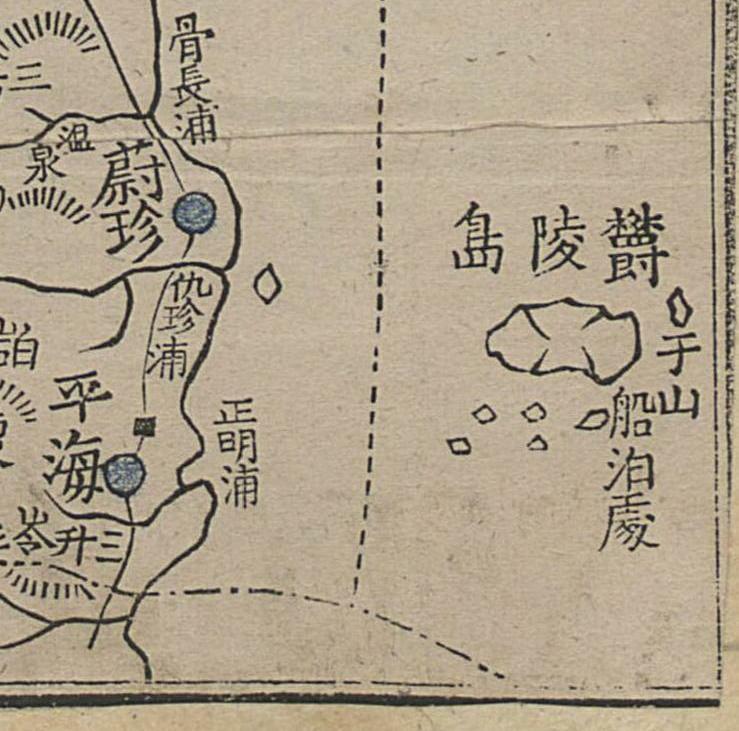 Sada Hakubo, who reported “How Takeshima & Matsushima Became Part of Joseon”(朝鮮国交際始末内探書1870), made a map of Joseon several years after his report. 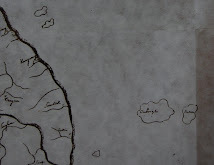 Sada did not draw Liancourt Rocks as Joseon’s territory in that map. It shows that Matsushima in the report was not Liancourt Rocks. Pro-Korean people very often say that 朝鮮国交際始末内探書 recognized Dokdo as Joseon’s territory, without enough inspection. Pro-Korean people like to insist about matter being not proved. They often say that The Dajoukan order(太政官指令1877) said Japan has nothing to do with Ulleungdo and Takeshima/Dokdo. But, I suspect whether they can explain the reason why Home Ministry's official did not quote "Dajoukan Order" to reject Nakai Yozaburo's petition requesting incorporation of Liancourt Rocks into Japanese territory in 1904. "Sada did not draw Liancourt Rocks as Joseon’s territory in that map. 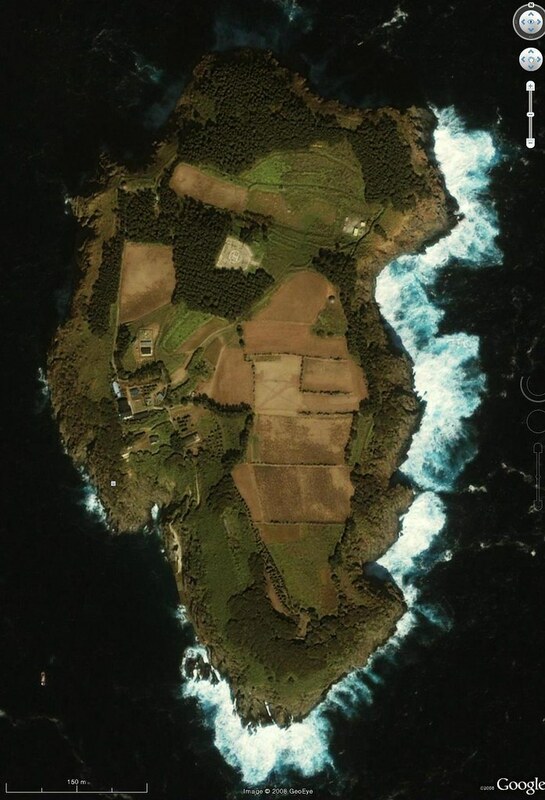 It shows that Matsushima in the report was not Liancourt Rocks." If it's true Sada Hakubo didn't Liancourt Rocks as Korean territory in his map, it's quite understandable. It's likely Dokdo was not important enough for him to draw in his map. The title of the book he wrote is "A Story of My Old Dreams about debate on the conquest of Korea" (征韓論の旧夢談)." The title shows how much he desired to conquer Korea. What he greedily wanted was the entire Korea. It's no wonder he didn't pay attention to this small, barren and uninhabited islets. It seems he had no interest in Dokdo even during his mission to Korea in 1870. He reported "We have no previous records of Matsushima(Japanese old name for Dokdo)." There are many records on Matsushima in Japan. He was just ignorant on Dokdo. already acknowledged Takeshima and Matsushima as Korean territory. His ignorance on Dokdo has nothing to do with Chaamiey's insistence "Matsushima in the report was not Liancourt Rocks." Chaamiey said "I suspect whether they can explain the reason why Home Ministry's official did not quote "Dajoukan Order" to reject Nakai Yozaburo's petition "
His statement reflects "Dajokna Order" that Japan has nothing to do with Takeshima and another island. Why didn't he quote "Dajoukan Order" to Nakai Yozaburo? Who except him knows the answer? Do you know? I understand that Sloww or other Pro-Korean people can not elucidate the reason of the contradiction which his/their claims on the issue of "Dajoukan Order" and "How Takeshima & Matsushima Became Part of Joseon" have. But, they would insist these two claims as ever, without explaining the reason of the contradiction. Can you elucidate why there's contradition on my claim? You insist Japanese people in late 19c always drew Takeshima(Ulleungdo) and Dokdo in the location of Argonaut and Dagelet respectively. In short, your claim is they were confused only about the locations so they always thought Matsushima was (today's) Takeshima whichever position it was drawn on maps. On the other hand, I assume they clearly understood the locations but had confusion about their names. I would agree with your claim if Japan made only maps depicting two islands. But considering the facts maps depicting three islands co-existed with them at the same period (fewer but surely existed) and Matsushima was drawn in the exact location and with the exact shape of Ulleungdo on every maps, I highly doubt Japanese had the consensus Matsushima was Dokdo though it can't be denied a few of them might have considered it as such. 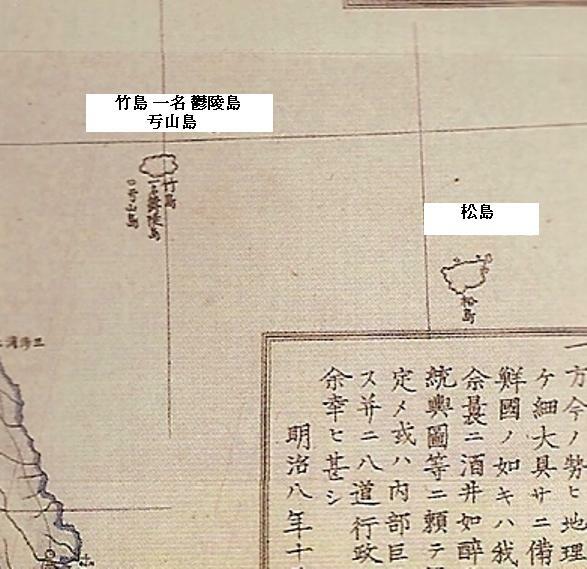 If they thought Takeshima was Uleungdo and Matsushima was Dokdo, why did the following maps draw “Takeshima” with the DOTTED LINE? Are you going to insist Japanese thought Ulleungdo was non-existent island? These maps definitively prove that Siebold's map caused confusion about their “names”, not their “positions”. I didn't say the Japanese were confused only about the locations. I think the general Japanese cartographers were confused by neither locations nor names. They didn't even know they were drawing those two islands in the wrong positions or not. They just referenced the western maps without knowing the locations were wrong. How do I know that? It's because almost all of the Meiji-era maps depicting two islands -Takeshima and Matsushima- in the same or similar wrong positions. If they did know, why didn't they correct it? You wrote "If they thought Takeshima was Uleungdo and Matsushima was Dokdo, why did the following maps draw “Takeshima” with the DOTTED LINE?" I didn't say Japan made only maps depicting two islands. There are two cases Takeshima becomes non-existent Argonaut. 1. There are three islands. -Takehsima ,Matsushima and Liancourt Rocks(Dokdo). 2. Takeshima was drawn in a dotted line. Thus, in the maps you showed, Takeshima is Argonaut. But in the maps with only Takeshima in a solid line and Matsushima, you can't say Takeshima is Argoanut , Matsushima is Ulleongdo and Dokdo was not drawn. In the maps with only Takeshima in a solid line and Matsushima, Takeshima is Ulleongdo and Matsushima is Dokdo even though they are in the wrong positions. I gave you the reason why they are in the wrong position by a link. It's very misleading to make every Takeshima and Matsushima in the Meiji-era maps as Argonaut and Ulleongdo respectively. Except the two cases I gave you before, Takeshima and Matsushima are Ulleongdo and Dokdo respectively. If Takeshima is Argonaut and Matsushima is Ulloengdo because they are in the wrong locations, is there any Meiji-era Japanese map depicting only those two islands in the accurate longitude and latitude? Why are there Matsushima in the shape of Ulleongdo? It's the result of copying the western maps. 朝鮮輿地図,1894) is one example Matsushima is Dokdo even if it's shpaed as real Ulleongdo. Takeshima in this map is definitely Ulleongdo because there's the name of Moutain in Ulleongdo. Two more examples are "朝鮮輿地全圖(1875)" and "新撰朝鮮輿地全圖(1882)". Those maps at the same time prove Takeshima and Matsushima are Ulleongdo and Dokdo even though they are in the wrong positions. 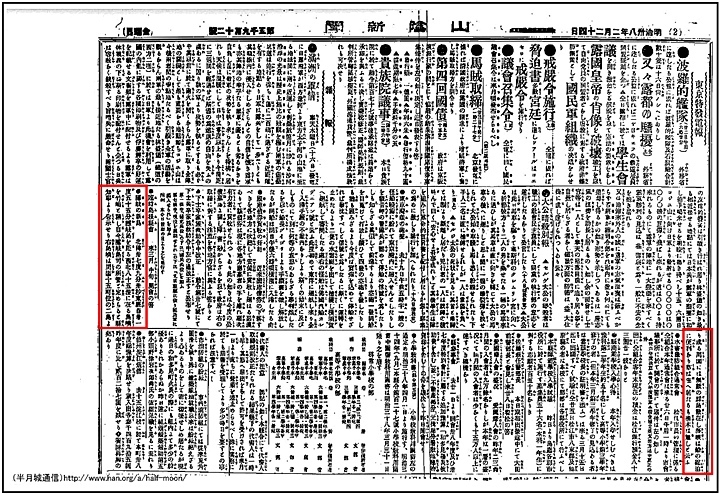 大日本府縣全圖 (1 and 2) and 満韓新図 also prove Takeshima and Matsushima are Ulleongdo and Dokdo respectively even though they are in the wrong positions. 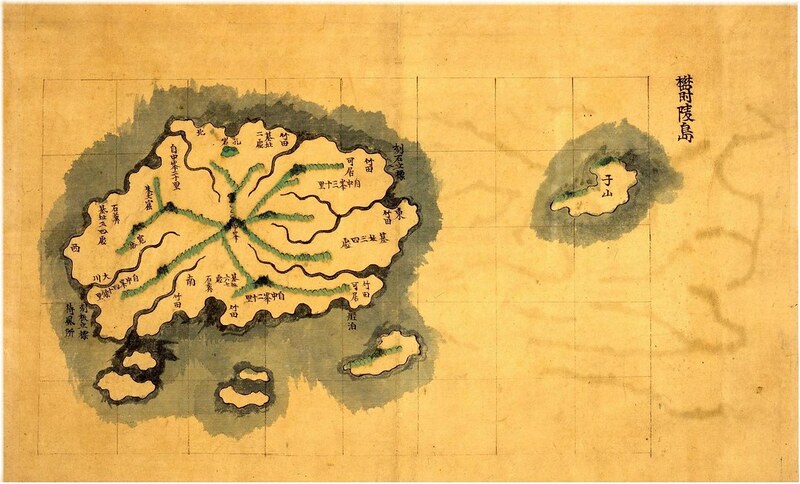 >>Why aren't there Japanese old official maps depicting those two islands as Japanese land? >>why did the Japanese government incorporate Dokdo into Japanese land saying it was ownerless? I don't understand why you still can't give up 隠州視聴合記. How do you think about following facts? 1. Onshu was Bakufu's demense at the time. 2. Tottori people were permitted voyages to Ulleungdo. 3. The writer said those islands were uninhabited. 4. It was written before the first encounter with Koreans at Ulleungdo. 5. The Japanese who met Korean captured them for illegal fishing. 6. Bakufu negotiated with Korea over sovereignty of Ulleungdo. Considering Sada's position as a diplomat, it's hard to think he has never looked through Japanese documents. He put the name “Matsushima” into the title竹島松島朝鮮附属ニ相成候始末 and described about it because he thought the island was worth paying attention to. What if Matsushima was Usando(Jukdo)? 1. There had been no record that described Usando(Jukdo) when the document was written. 2. Usando(Jukdo) is a neighboring island of Ulleungdo. 3. 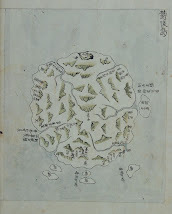 He depicted only Ulleungdo-look-alike island and its neighboring island (Usando). All of them agrees together. It's no wonder his map reminds me of Korean maps, it's highly likely he referred to Korean maps & docs because he had been to Korea before he submitted 朝鮮国交際始末内探書 and made the map. 東国文献備考 says Usando was Matsushima by Japanese name. And also, you contradict yourself. You insist Ahn Yong-bok's incident (Genroku incident) led Japan to renounce Matsushima and there remain records of it in both Korea and Japan. But Sada said that ONLY Takeshima has been renounced at the Genroku incident.竹島ノ儀ニ付テハ元禄度後ハ暫クノ間 朝鮮ヨリ居留ノ為差遣シ置候処 If Matsushima was Dokdo, why did he say there had been no record about Matsushima, even though he knew about Genroku incident? It proves either of your claims is wrong. I understand all agreed the 州 is not island and the point is if the Japanese gov. ( or Shimane ) recognized the islets as Japan or not. I still cannot read like Kumabear and Gerry did, because I don't understand the relation like, author wrote " (Because) Looking at Koryo is like looking at Onshu from Unshu " and then " Therefore ~~ ". Why therefore?. But, since the point the author stood on is Ulleongdo, I found that "the island ( is Korean territory)" I mentioned is Ulleongdo not Matsushima. So, the issue is if the Matsushima belonged to the Onshu or not at that time. I need to take time to understand all about the question 2. As for my question 3, I understood the SCAPIN677 is not effective due to the paragraph 6. You can't say Takeshima is Ulleungdo and Matsushima is Dokdo either. And I didn't say mapmakers “indicated” Takeshima is Argonaut, Matsushima is Ulleungdo. What they were indicating on their maps remains a matter of speculation. I guess they didn't even know what was wrong or what was right, what island looked how and existed where correctly. They just copied other maps(Japanese's and westerners') and referred to old documents when making maps. (You admitted “It's the result of copying the western maps “) As I said before, it can't be denied maybe some of Japanese made a map believing Dokdo(Matsushima) really looked like Ulleungdo and was out of Japanese territory without accurate knowledge. But it doesn't decide anything since there were various kinds of maps coexisted while contradicting each other. One thing that is sure is only people who actually sailed (investigated) to Ulleungdo found out it was what Japanese were calling “MATSUSHIMA”. If your theory is right, they would have identified it as “TAKESHIMA”as Japanese used to do from Edo era. --> Japanese Web Takeshima Research Center admitted there's no Takeshima in the Japanese maps made before 1905. Japan had never formally proclaimed her sovereignty of Takeshima before 1905. (Of course, she had never formally excluded it either)--> What a contradictory statement it is! I don't understand why you still can't give up 隠州視聴合記. -->"隠州視聴合記" is not the book I can give up or not. I just let the people know "隠州視聴合記" is the first Japanese document saying Dokdo was not Japanese land. --> Then, why did he say there's no previous records on Matsushima ? ---- The title "竹島松島朝鮮附属ニ相成候始末." was not made by him. It was the response to Japanese government's assignment ""竹島松島朝鮮附属ニ相成候始末." What if Matsushima was Usando(Jukdo)? -->Again, Meiji Government ordered him to find out how Takeshima and Matsushima became part of Korea. Do you think Meiji Government considered Japanese Matsushima as Usando(Jukdo)?No, right? --> I didn't say Ahn Yong-bok's incident led Japan to renounce Matsushima. Ahn's incident led to Genroku incident and Genroku incident led Japan to renounce Takeshima and Matsushima. Ahn Yong-bok's incident and Genroku incident are two separate incidents. --> I didn't say that. I exactly said "But in the maps with only Takeshima in a solid line and Matsushima, you can't say Takeshima is Argoanut , Matsushima is Ulleongdo and Dokdo was not drawn." Oh please you guys, if you want to have a serious debate go meet face to face. I have read the whole comments on this video, just to find out three vs one debating. The video is quite interesting, but this video has ONE definite flaw on it...which is that it is one-sided. It didn't explain the reasons, only focus on "illegal", "busted up", "brainwash", and ETC. A really clever video should be a viewpoint of both-side.